What If Italy Rolls Back Monti’s Reforms? 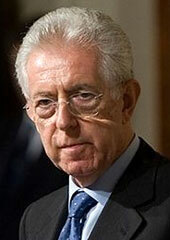 Italy has no choice but to build on Mario Monti’s achievements. Whoever wins the Italian election will sooner or later realize that Italy has no choice but to maintain the Monti achievements. The risk of Italy turning against the Monti recipe for stability is unlikely to materialize. Southern Europe will lose EU policy battles as long as it tries to push an agenda against Berlin and Frankfurt. Italy, Spain and France can only succeed if they propose measures supported by the ECB and the German government. These countries still need to do a lot in terms of reforms at home that is entirely within their own remit and responsibility. Ahead of the Italian elections last next month, almost all eyes seem to be on the disgraced former Prime Minister Silvio Berlusconi. Can he deprive the widely expected coalition of Pier Luigi Bersani and Mario Monti (center-left and center) a majority or even a return to office? Framing what is at stake in Italy this way misses the point. In his many years in office, Berlusconi actually did very little in terms of earnestly pursuing economic policies. He implemented few reforms, but also did little damage on this front. The damage he created was to the reputation of his country. In late 2008 and 2009, this approach served Italy well. Berlusconi (or, rather, his then-finance minister, Giulio Tremonti) did not grant the Italian economy a major post-Lehman fiscal stimulus. As a result, Italy’s public finances came through the post-Lehman recession in much better shape than in all other major Western countries except Germany. Only when the spread of contagion from Greece hit Italy in mid-2011, when Italy needed to make quick adjustments, did Berlusconi’s wavering path became intolerable. If the new government formed after the February elections adopts the old Berlusconi approach of doing only very little, the world economy may not have to worry very much for very long (other than a potentially serious bout of uncertainty right after the election with regard to forming a government). In line with the mandate given to him by Italy’s political class, Mario Monti has used his 15 months in power to do almost all the hard fiscal and reform work that really needed to be done. As a result, just holding the line would likely suffice for any new government. At the same time, Monti did not reform Italy root and branch. More work needs to be done. But his measures to streamline administrative procedures and to restrain the ability of courts to reinstate workers that have been dismissed for “economic reasons” did address some of the Italy’s most severe shortcomings. Time will tell by how much these measures have lifted Italy’s trend rate of growth. So far, it has only been by a miserable 0.8%. But the Monti reforms will at least have some lasting impact, possibly adding 0.2% points to annual trend growth. More growth impulses can be realized if the business of reforming Italy continues after the election. To unleash the full potential of its highly creative population, the country needs a further overhaul of its clumsy public administration and a thorough deregulation of its product and services markets. With such reforms, Italy could probably raise its trend growth rate to at least 1.5%. In other words, Monti has not worked a miracle. Instead, what he has done is enough to make Italy’s fiscal outlook easily sustainable for the foreseeable future. And that is a solid base to build on. Italy had a fiscal deficit of only about 3% of GDP in 2012, despite an almost 3% drop in GDP. Once the recession ends, Italy will likely have a deficit of around 1%. At a bond yield of 4%, Italy will have little problem in bringing down its ratio of public debt to GDP once the economy has returned to modest growth. But what if a new Italian government, under the influence of Berlusconi or not, were to undo the Monti austerity measures and/or reforms? If a new government, for instance, abolished the property tax without passing offsetting savings, the situation could become very awkward. The property tax imposed by Monti is quite unpopular, partly because it is effective: it is very difficult to dodge. For the tax authorities, it is easier to prove that somebody has a house than to prove what his or her taxable income is. In the election campaign, reflecting his populist streak, Berlusconi has promised to repeal the tax. If he offers no credible way to finance the gap, financial markets may lose trust in Italy. This would roll back much of the progress made over the past year that gave the Italian economy a new lease on life. More importantly, neither the German Bundestag, which has to approve all European Stability Mechanism support programs, nor the European Central Bank could offer any help to Italy if the Monti progress is reversed. They would certainly not stand for any additional support if Italy falls short yet again on ending the spirit of tax evasion as a popular sport. The ECB and ESM could probably contain the turmoil that might stem from hypothetical problems in Greece, Ireland and Portugal. That is not the case with Italy. Major turmoil there could rekindle massive contagion risks across the eurozone. I do not expect that to happen. Even in the unlikely event that a new Italian government were to try something funny, I would expect ECB president Mario Draghi, German Chancellor Angela Merkel and the bond vigilantes in the markets to bring Italy back to its senses fast. The same would hold for any attempt of a new Italian government to forge an anti-austerity alliance with France and Spain. At an EU summit last June, Southern Europe and France tried to push Germany into a kind of banking union that Germany did not want. After briefly celebrating that they had been able to put a banking union underwritten by the German taxpayer onto the political agenda, the Southern European countries soon noticed that Germany simply dragged its feet on this measure ever after, until it was structured in a reasonable and solidly oriented manner. The lesson for Southern Europe is that, as long as they need the German taxpayer and the ECB to underpin them, the effort to try to push an agenda against Berlin and Frankfurt — instead of jointly with them — will not get them anywhere. And from the ECB’s and the German government’s perspective, there is much which these countries still need to do — and can do — in terms of reforms at home that is entirely within their own remit and responsibility. The Italian elections feature prominently on the list of risks of what could still go wrong in Europe. But whoever wins the elections will sooner or later face the unpleasant reality that Italy has no choice but to maintain Mario Monti’s achievements. That is why the risk of Italy turning against Monti’s recipe for stability is unlikely to materialize.